OK, election fever is over and I can't say I'm looking forward to the next few years under DC and his new best chum. Still, that's democracy for you - you don't always get what you want. So, back to the book update and then I'll fill you in on the weaving stuff and some dyeing I'm doing right now (even as I type this). The next book I read was The Merchant's Mark by Pat McIntosh. I love these medieval mysteries, all set in Glasgow. Scotland had some very odd laws at that time and it makes it all very interesting. Gil Cunningham is a great character and he works with a French stonemason, father to his fiancee, who is also a bit of a character. The series is shaping up nicely, though I'm about 3 or 4 books behind now. I'd recommend these to anyone who likes a bit of historical crime. After that I had some stuff to read for work and for Eurocrime. I read A Razor Wrapped in Silk, third in an excellent series by R N Morris, which feature Porfiry Petrovich (from Crime and Punishment), as the investigating magistrate in late 19th century St Petersburg. These are very good and very atmospheric. A full review will appear on Eurocrime shortly but I did like it very much and seem to have got over my confusion with the Russion names, finally. Two debut novels from last year were selected for me to review for an upcoming promotion at work. So I read MR Hall's The Coroner and Winterland by Alan Glynn. I liked both of these very much. The Coroner I had started previously and laid aside for some reason but after I picked it up again I got really into it and could barely put it down. The main character Jenny is not a particularly likeable person, very abrasive, but by the end I had warmed to her and was rooting for her. I don't think there's been a series about a Coroner before (feel free to correct me if I'm wrong), and it's not a job I know much about so it was all very interesting, even if Jenny is not doing everything quite by the book. Winterland is a dark, gritty thriller set in Dublin with a grim character list of ex-terrorists, drug dealers and dodgy politicians. It's really well plotted and I loved the main character, Gina Rafferty. It's difficult to believe that this is a first novel. I shall look forward to reading more of him. So I managed to read those and get my reviews in for the deadline, which was today and now I'm reading the new John Connolly, The Whisperers, just published yesterday and kindly provided by Karen of Eurocrime again. I'm only 10 or so pages in so it's a bit early to tell but I'll keep you posted and will be sending a full review to Eurocrime in due course. That doesn't seem like many books and I think I might have missed a couple somewhere, but I can't think what they were. Also my reading had been rather curtailed by my current obsession with weaving. I love weaving but it does take a lot of time. It takes a very long time to set up the loom with the wool, ready to weave. Then the weaving takes quite a bit of time (I expect it gets quicker as you get better, but I'm still a newbie) and the light's not very good in the dining room where my loom is set up so although I can weave there in the evening with the aid of a few well positioned spotlights, I can't really do any of the setting up in the evening as you really need good light to be sure that it's right. Anyway I did my first real project - a scarf/wrap thing in a two colours of green wool. It's not perfect, there are a few errors in the weaving but the finishing means it has a slightly felted finish so that hides a few sins and generally it's big enough for the mistakes not to be noticeable. Here's the technical bit for anyone who's interested - this is a huck lace pattern from Handwoven magazine (can't remember the issue number and I can't find it right now), woven at 15epi with 20/2 worsted wool from Fibrecrafts. I loved weaving this and I've already wound the yarn for my next project, but I've not warped the loom yet as I need 3-4 hours uninterrupted time with no distractions to get it all set up right, and I've just been too busy for that to happen. 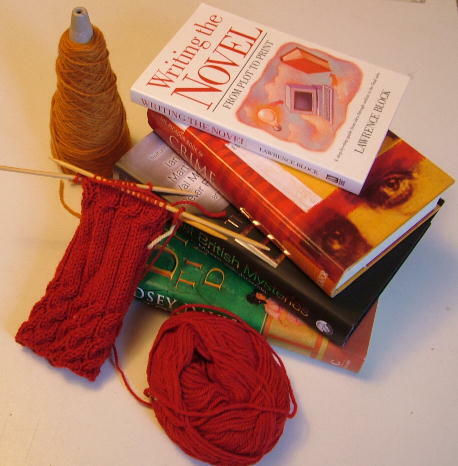 Maybe this weekend, though I have a vast pile of books to read, some of which need to take priority over weaving. This morning I am doing a spice dyeing workshop using instructions provided by the Online Guild of Weavers, Spinners and Dyers. They do a different workshop every month an this month is about dyeing with foodstuffs. So this morning I have been dyeing roving with paprika and turmeric, and then as I had my dyepots and equipment out I've also done a bit of dyeing with coffee and am just boiling some wool with teabags. I have this vague idea that I will knit a Kitchen Garden Shawl in some kind of modular, stocking stitch pattern, using handspun wool that I have dyed with stuff either from the kitchen or the garden. That should keep me busy for a while. On the needles currently is a secret gift project with a closely looming deadline so I have been speed knitting at every opportunity this week and am just about finished. More on that once the gift is safely despatched. Right, next up - a cup of coffee and the new John Connolly book. Don't bother me for an hour or so! Priscilla Masters started a series featuring Martha Gunn, Coroner at Shrewsbury a few years ago. There's only been two so far but I liked them.